I knew starting out on this project that I was never actually going to get that far in building the designs in code (how wrong I was). 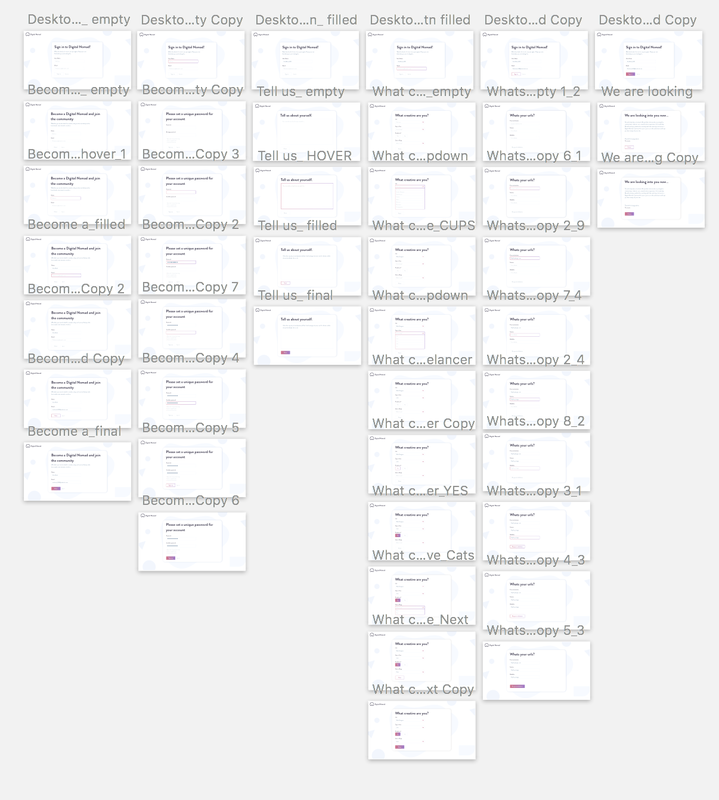 So I made the onboarding process a lengthy one which sounds nice and all but it turns out its very hard to code as you are having to store multiple different pages of content. This is a messy overview of what the onboarding process looks like in Sketch. A lot of these artboards are actually just interactions that I needed to do so I could make the Invision prototype look more like a real site. I think the onboarding is like only 5 pages long but each has a good bit of information to collect on the user. So I have opted to just have a basic sign in for now, ok? It’s literally just a sign up page and you are in, this is what I have at the moment. As you can see its very basic but it does its job perfectly. I am happy with this as to me it’s a proof of concept. The fact that I even got this to work had amazed me to be honest. One other point here getting those icons in the input was a slight pain but it turns out you just use the background-image class and you are good to go with a bit of styling that is. This takes away the whole validation process that I have been harping on about for a while now but this as a lot of other things can be added in when a future update to the site is done. There could be a two part sign up so there’s one for the nomad and one for the studio. Though even trying to get my head around this wasn’t happening and trying to code it would never work out. Though I can see this being the way it is done in the end. It could be that a nomad is affiliated with a studio and can add them in this way. 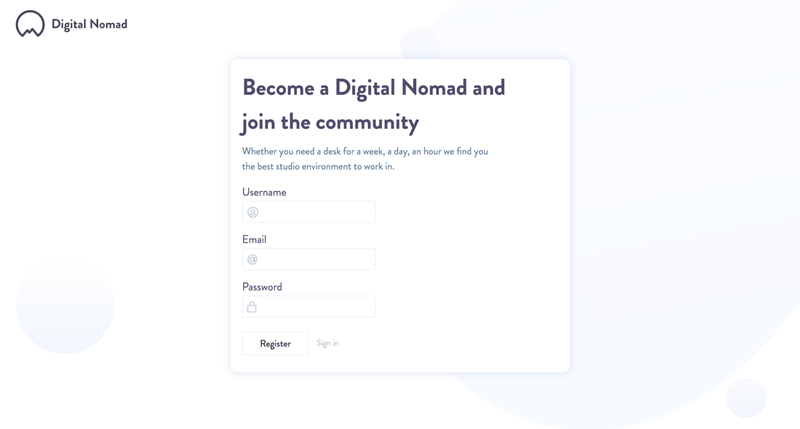 This means that the nomad will sign up and have an option somewhere to add a studio but this also would be a no go for now. To add them myself. This actually isn’t that bad of a task as you have seen Craft is a very to use CMS so the whole process doesn’t take that long. Now I have just been using dummy content which makes it a bit easier as it means I can change things to fit the layout better, which I can’t lie I did. This will probably be what is done for the first few hundred studio I would feel as who would really want to take the time to add in a studio? I am happy enough to add in the content as it doesn’t take that long and when you do a few it becomes second nature. I am actually really happy with how this had turned out in the end and I know for a fact that me five months ago would never believe how far it had come as I hadn’t even started coding it in any aspect.